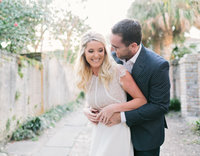 Grayson and Maddie are both graduates of The College of Charleston so it made perfect sense to use the gorgeous campus for their engagement session! The weather was perfect and these two came prepared to make the most of their session! They were relaxed and ready for some fun! I can’t get over how incredibly sweet the are together and how they just seem to fit effortlessly together! I can’t wait for their Dunes Club Wedding in Myrtle Beach this fall! Kristy Roderick Photography specializes in wedding photography, Engagement photography, Bridal photography, Portrait photography, Family photography and Senior photography, in Myrtle Beach, Charleston and surrounding areas. She prides herself on creating a unique and custom photographic experience for everyone she photographs! If you enjoyed looking at our portfolio and would like to know more about our photography services, please contact at 843.602.7299 or email me at kristy@kristyroderick.com We would love to hear from you!